Mahila Seva Samity was born in 1947 to provide relief and rehabilitation to women and children when partition displaced thousands of people from their homes. Today, we serve elderly women who have no families to turn to in their twilight years, survivors of domestic violence, children of poor working women, and adolescents who are in danger of being physically or sexually exploited or women who need shelter. To execute our various welfare projects we need the financial support of well wishers and people who support our cause. Please send your generous donations to our above address. Our ongoing projects include: an Old Age Home, Short Stay Home, Crèche and Nutrition Center for Children, and Swadhar. In addition, we run Legal and Family Counseling Services, a Handloom Unit and Weaving Center, and a Spice Unit. All these are described under Our Projects. The Old Age Home gives shelter, food, medical care & most importantly, self-respect to 31 elderly women whose families either cannot or do not take care of them. Begun in 1984, this project is partly funded by the Ministry of Human Resources of the Government of India. We have a total of 5 crèches. 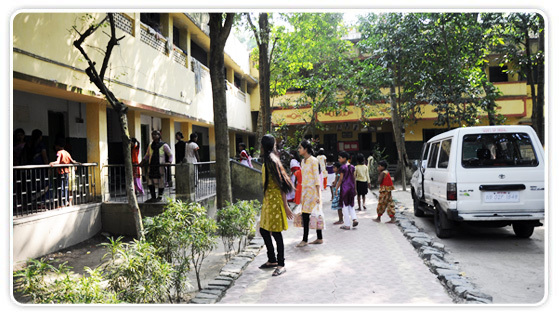 Some are sponsored by the Central Social Welfare Board and the Calcutta Council for Child Welfare. We have set up a shelter at Rajpur for young girls who are in moral danger, with funding from the Government of India.